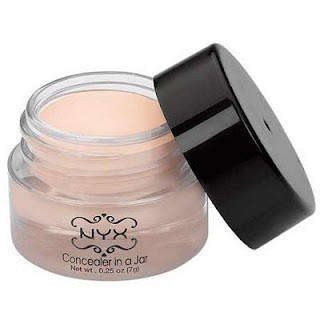 I love NYX especially their Concealer! 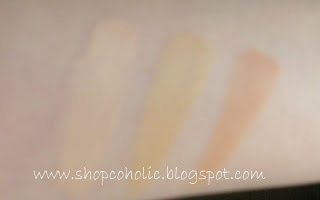 I read online its a great dupe for the MAC Studiofinish concealer for a fraction of the price.. I've heard so many good things about this tiny jar and after reading Nikki of Askmewhats' Product Review, I decided to give this little guy a shot! "Provides natural & lasting coverage of discolorations & imperfections without looking caked-on or clumpy. Super concentrated so just a little will do the job." * its affordable! Got the Beige & Medium shade from MakeupMasala for $3.50 each, while the Light shade from a swap. * very handy coz of its size. * difficult to choose colors online; that's why I bought 3 shades! * coverage is sheer, did not totally cover my dark undereye circles. Light - has a slight pink undertone. A bit light on my skintone but I use this on my undereye circles to lighten them. I think it will match NC15-20 skintones with pink undertones. Beige - Perfect match! Perfect for NC20-25, with yellow undertones. Medium - slightly dark on me. I think this shade will suit typical Pinay's with NC30-35 skintones. 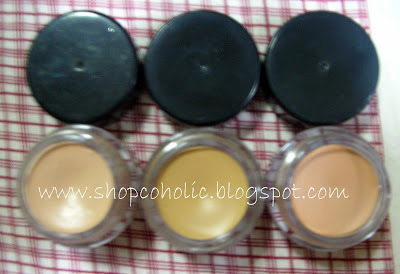 My other Concealer Reviews : Click here. Note: Light shade matches my inner arm (i have slightly pink undertones here) while the Beige shade matches my face (with slightly yellow undertones). Let me know what concealer/s worked for you.. Xiao! Another great review from you! Thanks Khymm. I think I will check these concealers out. But--do they break you out? I have heard that these contain mineral oil and it's not very good for the oily and acne prone (which I am both). I think it broke me out.. I am not sure but I am afraid to try again. hehe. I have the beige one. thanks for the review dear! i'm also very curious about this since the reviews are so great. nice review sis! hmm.. i'm actually thinking of getting one..
DIANE - oh! too bad to hear that! What concealer are you using now? DONNARENCE - its 7g. Same as the MAC studiofinish concealer. Haven't tried it though coz im happy with the MAC SELECT Cover up. hi khymm, i like your blog, i was so confused on what shade to choose since i havent seen the concealer itself.. i have pink undertones and fair skin.. you said that the LIGHT concealer matches pink undertones.. I have to choose between FAIR and LIGHT.. and what is the " NC15-20 skintone" thing? how would i know my skin tone? is there any site that you can recommend for me to understand that skintone thing.. :) thank you.. i really like your blog..